Hyundai America's internal design and technical center wanted to make a splash at this year's SEMA while showing off the new Veloster sport coupe. So they created the Velocity concept, which will debut at the show, under the Hyundai banner, as a showcase of what Hyundai's Irvine, California Design and Engineering divisions can accomplish. The Velocity will certainly live up to its name. The primary upgrade is tuning that pushes the tiny four-cylinder engine up to a massive 400+ horsepower thanks to modifications by Cosworth. The tiny 1.6-liter powerhouse sports a massive 350 lb-ft of torque for shaft-bending performance. 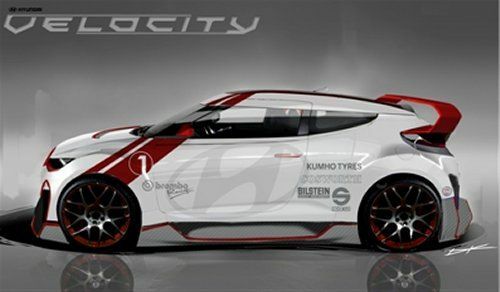 The exterior of the Veloster was customized to give it a more muscular look and several race-ready options were added. This no-holds-barred factory tuner sports 19x9-inch HRE lightweight satin-charcoal racing wheels, a body kit meant to hug the tarmac, and huge front and rear brake cooling ducts. A lift-reducing rear diffuser, oversized rear wing, race car design graphic, and powerful twin pipes finish off the road-burning look. Those large brake cooling openings mentioned before are for a reason: this new Velocity, with all of its power output, needs big stopping power to control it. The suspension has been thoroughly replaced with Bilstein springs, monotube dampers, and Brembo 4-piston calipers and two-piece rotors. These all work together to keep the fat Kumho Ecsta SPT 275/35R19 high performance tires on the pavement. Inside this racing monster is a custom Katzkin suede leather interior with Raven and scarlet-themed colors and red stitching. An integrated rollbar for track readiness is also built-in as is the Race-keeper Video GPS DAS.